"Children growing up in an atmosphere where beauty is considered an important part of daily life cannot help being inspired to develop their own original ideas in these areas, nor can they help being prepared to live aesthetically themselves. There is a 'togetherness' in sharing a prepared table that even very small children feel, although they cannot express it verbally." These are words that guided me on my homemaking journey at the beginning of my child rearing years. Mrs. Schaeffer speaks so eloquently when she writes; she creates word pictures of simple things that speak so profoundly to our souls. In another place she shares that every dinner table should have a centerpiece that is vibrant, interesting, and transitions with the seasons and experiences of life. Such a focal point provides family members with objects of nature and beauty to enjoy. Flowers, moss, rocks, shells, seed pods, and more can be gathered outdoors and be brought inside to make creative points of interest without added expense or fuss. Including children and grandchildren in the process might mean adding points of color found in small toys like Lego's, plastic figures, or miniature tea sets. An atmosphere where creativity is encouraged can inspire a child and set the stage for original ideas as they grow through life. 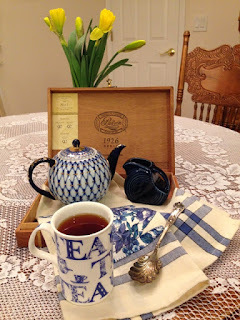 Remembering a favorite song from my teen-age years as I share this vignette of favorite blue things. It's that time of year! 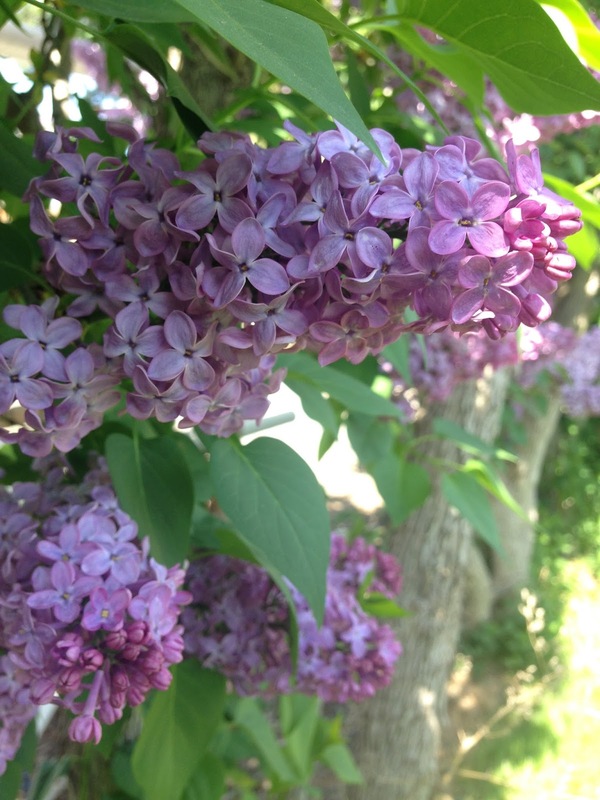 Spring has erupted and the lilacs are in full bloom! I can see the row of lilac trees in the front yard, all abloom in several shades of purple. They were started from shoots taken from my in-laws home more than twenty years ago. They have thrived and ended up growing so tall that I could no longer reach the blossoms. Last year we decided to trim them to a manageable height, and although we were careful to trim at the right stage of their bloom cycle, I will admit to being somewhat fearful that we wouldn't have blossoms this year. But they are more abundant than ever! A walk down lilac row is filled with their fragrance. Extraordinary! Just wonderful. And with the gentle hum of bees as they work their magic among the blossoms. Someone is going to be fortunate to have some lilac honey in their hive! It's the little blessings, like lilacs, sweet fragrance, and beauty that make life happy and complete. 1. Heat oil in a large skillet. Add onion, potato and cauliflower and cook gently for 3 - 5 minutes, stirring frequently. Add the garlic, green chilies, ginger and spices. Cook and stir for 1 minute. 2. Add stock, tomatoes, and eggplant and season with salt. Cover and simmer gently for about 30 minutes or until tender, stirring occasionally. 3. Mix cornstarch and cold coconut milk together until smooth and stir into mixture. Taste and adjust the seasoning if necessary. Serve hot with Basmati or Saffron steamed rice. Drain tofu, rinse and squeeze out excess water. Cut into 1/2 inch cubes. Place tofu in large non-stick skillet, add chicken seasoning and mix to coat. Saute until tofu is browned, adding oil as necessary. Remove pan from heat and set aside. To make sauce, dissolve cornstarch in soy sauce in a small bowl. Add rest of ingredients and stir to mix. Have all vegetables chopped and ready before proceeding with cooking. heat a small amount of oil over medium-high heat in large wok, skillet or saucepan. Add vegetables in following order, sauteing briefly (1 - 2 minutes) between each addition: 1) onions, 2) celery and carrots, 3) green or red peppers, 4) broccoli. When broccoli has turned bright green and is still crunchy, add tofu and stir fry sauce. Cook, stirring constantly until sauce thickens and vegetables are crisp tender. Add cashews or almonds, ginger and green onions. Serve over cooked rice, couscous or Oriental noodles. Variation: Substitute a frozen Oriental vegetable mix for fresh vegetables. Add water chestnuts, fresh or canned bean sprouts, or very vegetables as desired. Savory tofu mixed with vegetables and topped with a cornbread topping. Yum. It can't get much better than that! Mix together soy sauce, peanut butter, onion and garlic powder. Work mixture into tofu until well coated. Fry in non-stick skillet until tofu is browned, adding oil as needed to prevent sticking. In a large non-stick skillet, saute onion, bell pepper, and garlic in a small amount of oil until soft. Add chili powder, oregano, and cuming. Saute briefly. Mix in rest of ingredients and browned tofu. Pour into a 9 X 13 inch oiled baking dish. Cover with cornbread topping. Bake in preheated 350 degrees oven for 30 - 35 minutes or until cornbread is golden.